I met Andy while we were both studying abroad in Europe. I was studying in London and he was in Florence, Italy. We met through mutual friends right underneath The Duomo – the enormous cathedral towering over the heart of the city. We hit it off the night we met and ended up seeing each other in several European cities over the following four months. Upon returning to the US, we quickly realized how much we cared for each other, and decided to take our relationship to the next level and be boyfriend and girlfriend. I am from the Boston area and went to school in upstate New York, and Andy is from Fairfax, Virginia. We dated long distance for two years as I finished college, and then I moved down to Arlington, Virginia to be with Andy who was working in Washington, DC. Three years later, we traveled back to Florence and Andy proposed right in front of The Duomo, the exact spot where we first shook hands, five and a half years later. Choosing The Lenox was the best decision we made. We knew we wanted to get married in Boston (my hometown!) and as soon as we walked into The Lenox, we felt at ease and loved how elegant and charming it is. But as soon as we saw the Dome Room, we knew with 100% certainty that this was the place for us. Domes seem to be a theme in our relationship, and we both knew we just had to get married under that gorgeous dome. It feels European in a way, and very classy, sophisticated, and elegant without being over the top. We felt completely at home there, and couldn’t wait to plan the whole day. Any Stressful Moments During the Planning Process? I found wedding planning to be an absolute pleasure. I enjoyed every moment of it and got a majority of it done within the first few months of being engaged. Andy was incredibly helpful too! It was so much planning our day together. We also hired some incredible people who were a pleasure to work with. And my philosophy is that I hired professionals and I let them do their job! So, I didn’t have any really stressful moments. Just excitement and anticipation leading up to the big day! The entire day was so wonderful and so perfect for us. From the moment we checked into the hotel, we were giddy with excitement for all that was to come. Alison Majka did a phenomenal job throughout the whole process and throughout the whole weekend with the most thoughtful touches. Waiting for us in our suite were our favorite snacks and beverages with a sweet card from Alison. The day of the wedding was amazing. 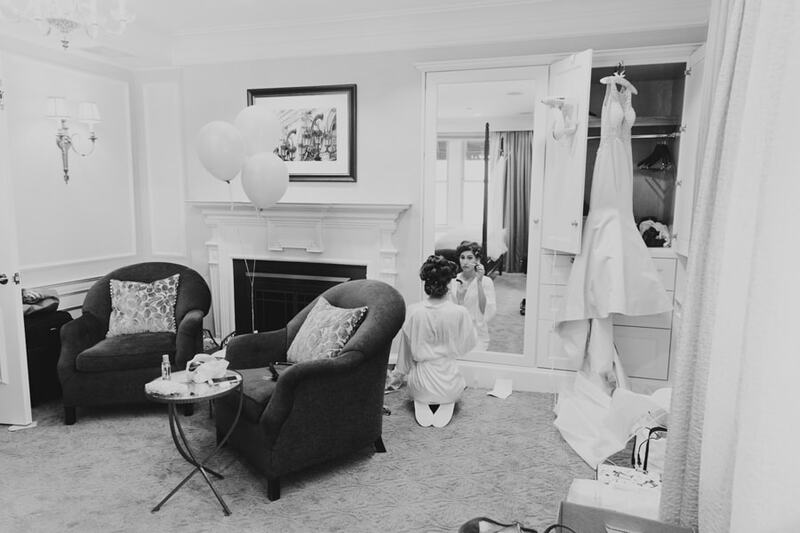 Getting ready in my suite with all my girls, putting my dress on, seeing my Dad, walking down the aisle with the both my mom and my dad, seeing Andy in his tux waiting for me at the end of the aisle, exchanging our personal vows, Andy breaking the glass (he had a great stomp! ), taking photos in Copley Square, our first dance, the Hora and going up in the chars, and taking photos up on the roof with the red Lenox letters behind us – these were all such incredible moments that made up the most wonderful day. We also had an incredible band and that made all the difference in the world! And when we got back to our suite at the end of the night, Alison had printed out a photo of Andy and me from right after the ceremony, and she put it in a card for us with a sweet message. The whole team at the hotel and the entire experience truly exceeded our expectations. Any Advice For Newly Engaged Couples? Enjoy the process of wedding planning. It is such an exciting and wonderful time and it goes by so quickly. Also, I felt very present the whole day and I took moments to look around, take a deep breathe, and just take it all in. It is the most special day being surrounded by family and friends, marrying the love of my life! There is nothing better than that! Also, hire a videographer. It was something we did pretty late in the game because we weren’t sure we had the budget for it (and honestly weren’t sure it was a necessary expense), but having a video is so priceless, and I can’t tell you how many times I’ve watched it with a huge, goofy grin on my face. Hair/Makeup: Hair by Thiago Angelo. Makeup done by myself with products and advice from Blue Mercury.